The way we used to do art appreciation (and still do to some extent) is to introduce an artist for which I could find a great picture book (like the Laurence Anholt books, or the Smart About Art series, or others), look at three to five sample prints of that artist, and then do a project in the style of that artist. Nadene at Practical Pages has great posts of ideas and you can see some here we have done (though that page is a work in progress and I haven’t linked up all my posts there). I realized the importance of art appreciation when, during my Master’s degree in Fine Arts Integration in Education, I took a class (aptly named “What Makes it Art?”) that challenged my view of abstract paintings as art. 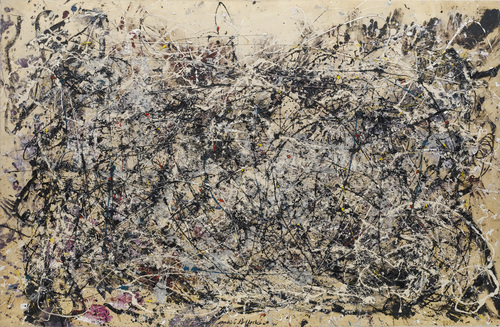 I would previously look at a Jackson Pollock or Wassily Kandinsky painting and wonder what made it art when they looked like meaningless squiggles. What my professor made me realize is that within those apparently meaningless paintings, there are artistic qualities that we, as viewers, can appreciate. Unbelievingly, I started enjoying modern art. While reading Action Jackson to my son. He looked at the painting in the book and said, “That’s not a nice painting!” Obviously, I still have some art appreciation work to do with the kids! Perhaps learning to appreciate modern art takes time. The above way of doing art appreciation is a bit more time consuming; I have to find corresponding art projects and plan to set a good chunk of time aside for it. However, the children really enjoy it. It combines an art project,in which I can teach some elements and principles of art, and pose an artistic open-ended problems, with appreciating works of art and learning about art history. If you already do art projects via another curriculum, or Pinterest pins, but you still want to include art appreciation, the Charlotte Mason way to study art is incredibly valuable. You can do this as you eat breakfast or lunch, and easily fit it into your schedule about once per week, or every other week. Even once a month. Whatever you can handle. Once per month is better than not at all, right? I have an amazing friend who downloaded three prints per artist from an extremely long list of artists we had compiled. She shared the jpg’s with me and we both ordered the prints from Shutterfly. I now have a box replete with artist cards. 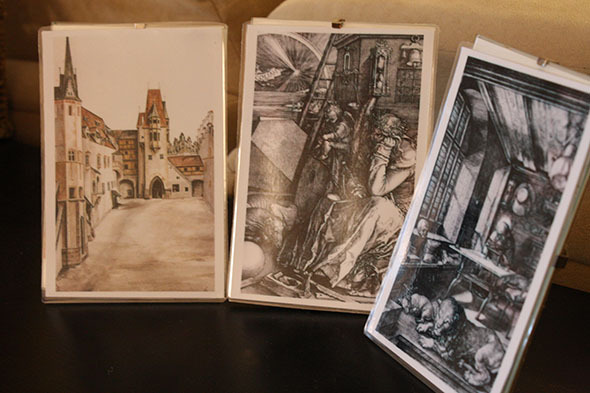 If you don’t want to go to that trouble, print them off the internet on a color printer, or use art postcards like the Dover art cards. I laminated all my photos and now display an artist per month in our kitchen. At breakfast or lunch when I am first introducing the artist, I will give a bit of background info about the artist (very short), and then ask Bear and J-jo to describe one of the paintings. We look at the painting very closely. Then turn it over and try to see how much of it we can remember. Talking about art helps grow your child’s language skills, and helps you gain insight into your child’s way of seeing the world. I have made an art appreciation printable to get you started. 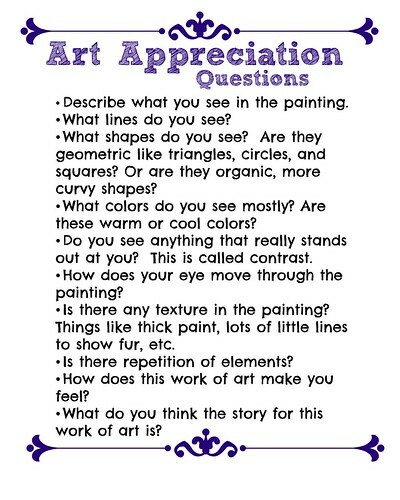 I’ve worded the questions for a painting, but you can adapt these for any art medium. Help your students have a conversation about art. Ask them questions about what they see and discuss the elements of art as they pertain to the piece you are observing. I modified this from something I used to do in my mainstream classroom – art was an integrated subject and there were no art specialists. The third graders I taught had a weekly art journal. They picked an art card (the school had this fabulous art program no one was using, so I had taken all the postcard sized prints from it) and then wrote about it. I provided questions like the ones in the printable to get them started. I don’t recommend making your kids write. As homeschoolers, this is your chance to have conversations about art. Download the Art Appreciation Printable. I discovered a great resource of timelines and information about art periods and movements that is too good not to share. Smarthistory from Khan Academy is another great art appreciation resource. Nadene has a famous artist lapbook I keep meaning to do with my kids. Garden of Praise is one of my frequent visits for images and short bios. 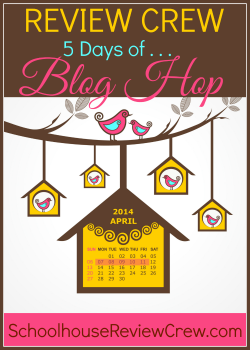 This post is part of the TOS blog hop. Click on the graphic below to see all the blogs participating. Great ideas to move to a more advanced appreciation of art. We do weekly art projects (more art than crafts!) and my children are developing an appreciation for art. We’ve done art based on many children’s illustrators. Maybe we will give artist of the week a try. So many great ideas, so little time. 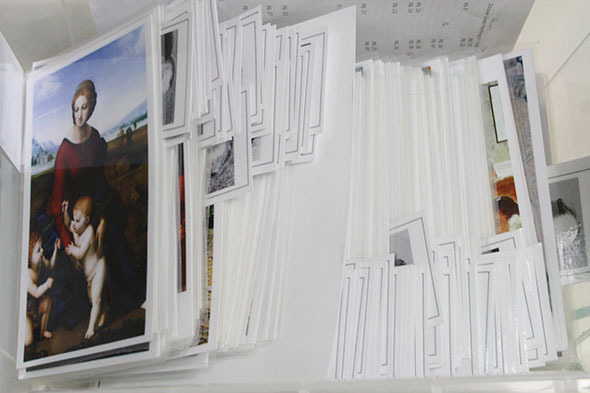 We began doing artist study and even bought the picture cards but it fell to the side. Thanks for this reminder! What a wonderful summary! Very helpful. I don’t do enough Art Appreciation. Thanks for the tips and the printable! Thanks, Brandy! I would love if you sent them here! Thank you!! you’ve just inspired me to give art appreciation another go, it’s been years since we have done it. It can be done, I don’t have to make it complicated!